This recent fine spell of weather has seen me rushing from one corner of Wales to another. The south-east for peregrines (see previous post), the north west for more peregrines , and earlier this week the south west. I ended up feeling like a headless chicken with the law of diminishing returns becoming more and more operative! My last trip was to Tenby. I am about to put in my summer order for postcards and was hoping to include one new design of the town, surely one of the loveliest in Britain. After many years of inaccessibility the island of St. Catherines (just off Tenby) is now open to visitors, and I guessed that it would provide a novel viewpoint. Looking at the OS map and consulting the local tide tables suggested that late afternoon on Tuesday would be the ideal time to visit. It would be low tide, ensuring that the widest expanse of sandy beach would be uncovered. 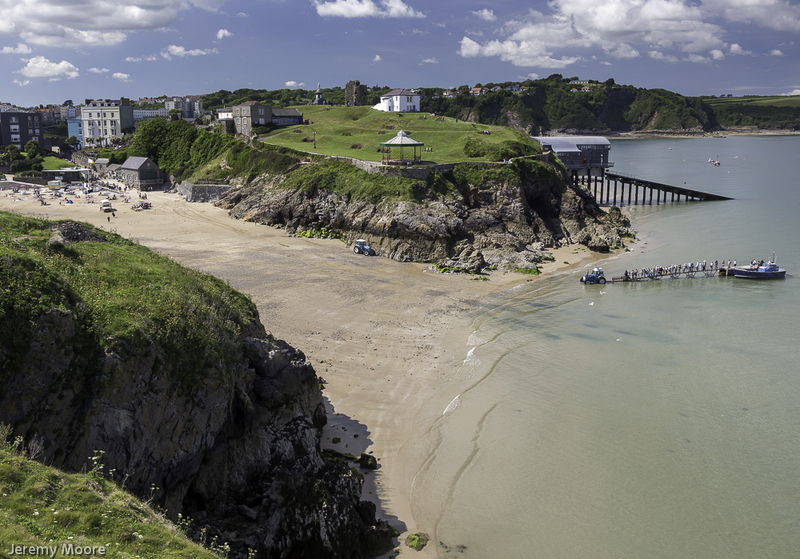 My angle of vision across to Tenby would be exactly at right-angles to the sun’s rays, such that a polarising filter would be at its most effective. And the weather! Perfect! I handed over my £3.50 and climbed the steps up to the island. A “tour guide” said it would be absolutely fine to do some photography while I waited for him to return with his next group. I scrambled up a low rocky slope to get a better viewpoint and set up my tripod. I had taken just one image when I heard a voice bellowing at me. “Oi….what are you doing up there?…this is absolutely ridiculous….get down from there immediately….what if you fell down the cliff?….. what if someone followed you and fell down the cliff?…..what if a child fell down the cliff?….. what if someone on the mainland sees you and reports it to the Council? It went on and on. He slowly calmed down and told me that he was the new owner and I could be putting at risk his £2 million investment. I apologised for not noticing the “keep to the path” signs and inadvertently finding myself beyond the railings (I suppose you don’t see what you don’t want to see…..), and returned to the beach. As far as the owner is concerned, I last saw him up to his knees in seawater, apparently berating an angler who had clambered across the rocks at the base of “his island”. I fear a heart attack awaits him……. Anyway, I digress. I parked nearby on the grass verge of a public road and walked a short distance down to the nearest pool. Here I discovered that, inadvertently or otherwise, the original owners of the estate had created a “mirror pool” similar to those built by bird photographers to take images of birds and their reflections. By dropping down a few feet below the dam I could get the water surface very close to eye level. I set up my long lens on the tripod and began photographing the dancing clouds of blue damselflies which were egg-laying into submerged vegetation in the pool. It was a gorgeous sight, albeit set to a soundtrack of explosions and machine gun fire from the Range a couple of miles away. Postscript: The one image I did manage on St Catherine’s (see above) is fine for a postcard. While things did not turn out as I hoped, the planning I did for this shot was enough to ensure success. Even with more time I doubt I could have done better. This entry was posted in Uncategorized and tagged bosherston, Castlemartin range, elegug stacks, liliy ponds, national trust, St Catherine's island, stack rocks, Tenby. Bookmark the permalink.